← Christmas Wish Committee Meeting on Wednesday, October 4 – New Members Welcome! 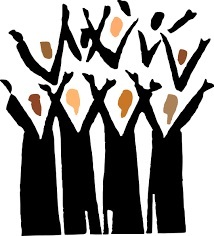 The Parish Choir of St. John’s Music will hold its first rehearsal Sunday, October 1 at 9:30am in the Music Office adjacent to Powers Hall. We welcome and encourage singers of high school age and up to join with us. No audition is required only your willingness to participate in the joy of singing. The Parish Choir participates weekly in the 11:00am Sunday liturgies. Weekly rehearsals are held on Wednesday evenings, 7-8:30pm. For those unable to commit to a weekly schedule of rehearsals and weekend liturgies please consider our FIRST SUNDAY CHOIR program. For that you can join with us on the first Sunday of each month for the Sunday morning rehearsal (9:30am) where we learn an easily singable piece to be sung at the 11am liturgy that morning. Coffee, juice and tasty breakfast treats are provided. Come join us and get into the “sing” of things! This entry was posted in Music, Parish Choir. Bookmark the permalink.